Synthetic peptide corresponding to TRIM21/SS-A aa 463-475 (N terminal). WB: HEK293 lysate overexpressing human TRIM21/SS-A. IHC-P: Human colon tissue. ICC/IF: U2OS cells. Flow Cyt: HeLa cells. Our Abpromise guarantee covers the use of ab4369 in the following tested applications. WB Use a concentration of 0.2 - 1 µg/ml. Can be blocked with Human TRIM21/SS-A peptide (ab23028). E3 ubiquitin-protein ligase whose activity is dependent on E2 enzymes, UBE2D1, UBE2D2, UBE2E1 and UBE2E2. Forms a ubiquitin ligase complex in cooperation with the E2 UBE2D2 that is used not only for the ubiquitination of USP4 and IKBKB but also for its self-ubiquitination. Component of cullin-RING-based SCF (SKP1-CUL1-F-box protein) E3 ubiquitin-protein ligase complexes such as SCF(SKP2)-like complexes. A TRIM21-containing SCF(SKP2)-like complex is shown to mediate ubiquitination of CDKN1B ('Thr-187' phosphorylated-form), thereby promoting its degradation by the proteasome. Monoubiquitinates IKBKB that will negatively regulates Tax-induced NF-kappa-B signaling. Negatively regulates IFN-beta production post-pathogen recognition by polyubiquitin-mediated degradation of IRF3. Mediates the ubiquitin-mediated proteasomal degradation of IgG1 heavy chain, which is linked to the VCP-mediated ER-associated degradation (ERAD) pathway. Promotes IRF8 ubiquitination, which enhanced the ability of IRF8 to stimulate cytokine genes transcription in macrophages. Plays a role in the regulation of the cell cycle progression. Enhances the decapping activity of DCP2. Exists as a ribonucleoprotein particle present in all mammalian cells studied and composed of a single polypeptide and one of four small RNA molecules. At least two isoforms are present in nucleated and red blood cells, and tissue specific differences in RO/SSA proteins have been identified. The common feature of these proteins is their ability to bind HY RNAs.2. Isoforms 1 and 2 are expressed in fetal and adult heart and fetal lung. The coiled-coil is necessary for the cytoplasmic localization. The B30.2/SPRY domain is necessary for the cytoplasmic localization, the interaction with IRF3 and for the IRF3-driven interferon beta promoter activity. The RING-type zinc finger is necessary for ubiquitination and for the IRF3-driven interferon beta promoter activity. Interacts with SKP2 and CUL1 in a RING finger-independent manner. Autoubiquitinated; does not lead to its proteasomal degradation. Deubiquitinated by USP4; leading to its stabilization. Cytoplasm. Nucleus. Cytoplasm > P-body. Enters the nucleus upon exposure to nitric oxide. Localizes to small dot- or rod-like structures in the cytoplasm, called cytoplasmic bodies (P-body) that are located underneath the plasma membrane and also diffusely in the cytoplasm and are highly motil in cells. Cytoplasmic bodies are located along the microtubules and do not share the same cytoplasmic bodies with TRIM5. Colocalizes with DCP2 in P-body. 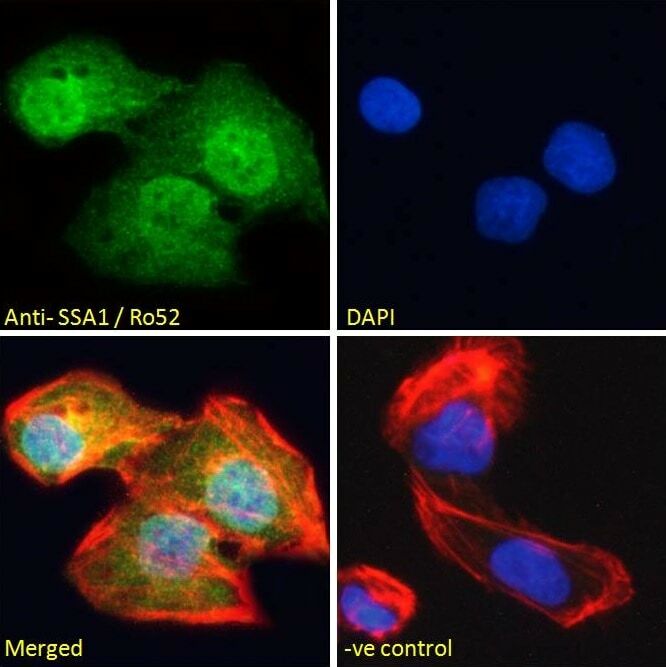 Immunocytochemistry/Immunofluorescence analysis of U2OS cells labelling TRIM21/SS-A with ab4369 at 10 µg/ml. Cells were paraformaldehyde fixed and permeabilized with 0.15% triton. Primary antibody icubation was for 1 hour followed by incubation with an Alexa Fluor® 488-conjugated secondary antibody at 2 µg/ml. DAPI nuclear counterstain was used. Flow cytometry analysis of HeLa cells labelling TRIM21/SS-A with ab4369 (blue line) at 10 µg/ml. Cells were fixed with paraformaldehyde and permeabilized with 0.5% Triton. Incubated with the primary antibody for 1 hour followed by incubation with Alexa Fluor® 488-conjugated secondary antibody at 1 µg/ml. IgG control: Unimmunized goat IgG (black line) followed by Alexa Fluor® 488-conjugated secondary antibody. Publishing research using ab4369? Please let us know so that we can cite the reference in this datasheet. There are currently no Customer reviews or Questions for ab4369.